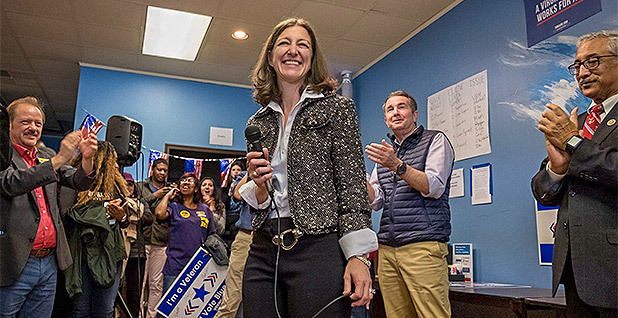 That's what Elaine Luria — the newly elected Democrat from Virginia's 2nd District — will keep in mind as she tries to navigate the hallways in January. She spent 20 years serving on ships as an officer in the Navy, deploying six times. "Finding your way around an aircraft carrier is pretty complicated too," Luria, 43, said in a recent interview. "So if I can do that, I'll probably be able to find my way around the Capitol." She will join a moderate Democratic coalition vying to maintain its strength in the new Congress, on top of the ballooning progressive wing of the party. But she won't shy away from green issues, particularly sea-level rise and offshore drilling. Her district is one of the most vulnerable in the country to the effects of climate change, and Luria made those issues key to her bid to oust one-term Rep. Scott Taylor, a GOP member of the Climate Solutions Caucus (Greenwire, Oct. 29). That earned her endorsements from the League of Conservation Voters and the Sierra Club, and her background in the Navy as a nuclear engineer helped win support from 314 Action, the group that promotes scientists running for office. In the new Congress, Luria said she'll make investments to combat sea-level rise and banning offshore drilling top issues. She wants to be a co-sponsor to a bill from neighboring Virginia Democratic Rep. Don McEachin that would ban offshore drilling along the coasts of Virginia, North Carolina, Maryland and Delaware. "Health of the Chesapeake Bay is a top priority," Luria added. "That includes not only funding for Chesapeake Bay cleanup, but also a lot of the environmental regulations that have been rolled back recently that allow more pollutants into the water and air, affecting the quality of the bay." To be sure, she'll almost always have the military's interests in mind, just as Taylor did. The Hampton Roads region is home to the world's largest naval base, and the 2nd District has a massive concentration of active-duty service members and veterans. That's reflected in the committees she's vying to get a spot on. Luria said she's interested in the Armed Services and Appropriations panels, as well as the Science, Space and Technology Committee. "I want to make sure that the committee assignments that I advocate for are those that are going to impact this district the most," she said. Luria opened a gift shop in 2015 called the Mermaid Factory, which now has two locations in Virginia Beach and Norfolk, and eventually retired from the Navy in 2017. 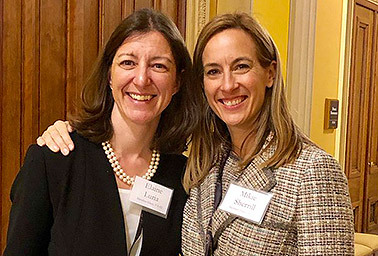 Both are experiences that she says gave her a centrist, pragmatic attitude toward policymaking and solid connections in the local business community. She got help on the campaign trail from the business-friendly New Democrats, and she said she'll join the caucus when she gets to Congress. Luria is a political newcomer, but it was a rough campaign on both sides. Taylor ran ads calling her a "puppet" of House Minority Leader Nancy Pelosi (D-Calif.), while environmental groups chipped in on ad campaigns knocking Taylor for voting for the Republican repeal of the Affordable Care Act. Ultimately, the health care messaging prevailed — as it did for Democrats across the country — but Luria said she's still undecided on how she'll vote for speaker. She noted Pelosi "definitely has a very strong track record, and I'm sure that she will be looking for support," but added she hasn't made up her mind yet. Luria is in town this week with all the new House members for orientation, but in her downtime between now and January, she said she's most concerned with building her staff. But you might find her roller skating. At her election night party, a friend asked Luria's 9-year-old daughter what she was most looking forward to when the campaign is over. Her answer, according to Luria: "I just want her to take me roller skating." So they went last week, and Luria had just one concern. "Hopefully I don't fall and break a leg or anything," she said. "That would make it harder to get around the Capitol."